Angelo Contini plays the trombone since he was 12 in the marching band of his hometown. Interested to jazz and free jazz taking place in Italy he collaborates with trumpet player Guiso Mazzon and percussionist Tony Rusconi and in the vey first 80s is part of Gruppo Contemporaneo, whose “Aspettando I Dinosauri” is considered an archetypal record for improvised music in Italy. 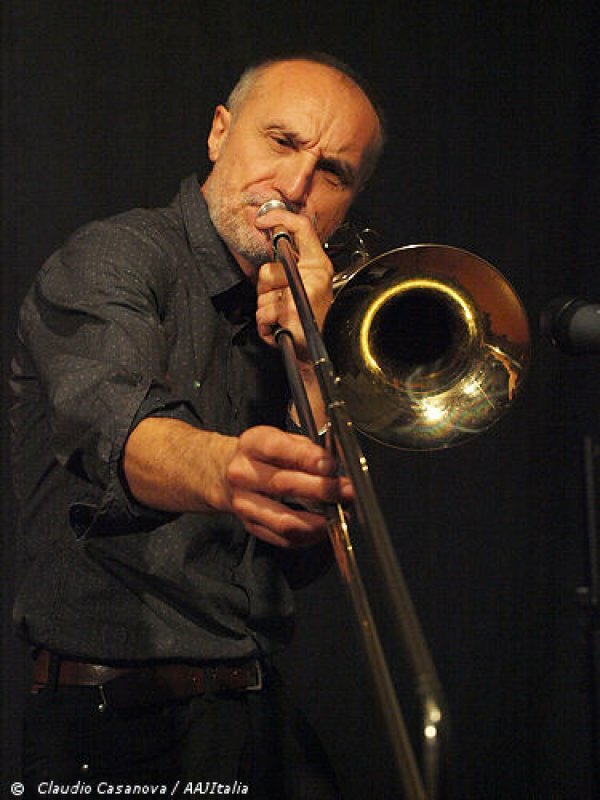 He has developed a deep knowledge of the possibility of the trombone and, being Roswell Rudd his first influence, got a very personal style that has often been considered very close to Paul Rutherford’s flexible one. He plays in several projects including multi-media, theatre and dance and has played in France Belgium, Germany, UK and USA. His most recent musical collaborations are with musicians from all over the world including: John Russell, Harri Sjöström, Vinny Golia, Lisa Mezzacappa, Viv Corringham, Radu Malfatti, Ute Wasserman, J-M van Schouwburg, Alison Blunt, Gianni Mimmo, Alessio Pisani, Mirio Cosottini, Cristiano Calcagnile, Xabier Iriondo, Fabio Sacconi, Stefano Pastor, Adriano Orru, Silvia Corda, Paolo Sanna, Elia Casu, Gianni Lenoci, Marcello Magliocchi, Mario Fragiacomo, Luca Bonvini, Enzo Rocco, Pat Moonchy, Roberto Del Piano, Stefano Giust, Filippo Monico, Massimo Falascone, Paolo Tofani, Claudio Lodati, Irene Robbins etc. He recorded for Bull Records, Amirani Records, Splasc(h), Setola di Maiale, Bunch records among others.